This bicycle route snakes out of the city centres heavy traffic and soon finds the leafy suburbs of South Dublin and Rathfarnham. The Dublin Mountains’ sounds impressive, but are in reality a misnomer for two reasons. Firstly, they are only barely within Dublin County, their spine demarcating the boarder between it and Wicklow County, with its wild and wind swept scenery. And secondly, theres not a single mountain to be found there. With only a handful of peaks over 500 metres the Dublin Mountains are hardly alpine, but rather hills. However it would be a mistake for a cyclist of any level to understate them, for they are hills with attitude! 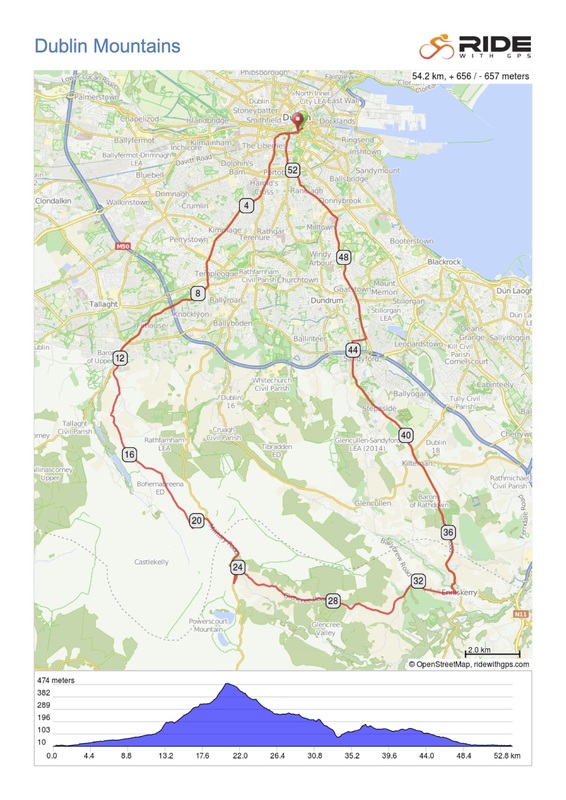 The route snakes out of the city centres heavy traffic and soon finds the leafy suburbs of South Dublin and Rathfarnham which is a historic area deserving of its cycling exploration. The route gradually rises upwards from virtually sea level by the life’s banks, but upon reaching Rathfarnham the gradient begins to make itself more apparent. Gradients of roads in elevated areas of Ireland can sometimes come as a surprise to cyclists, as eschewing the more considered Continental approaches such as switchbacks or staggered ascents, Irish road builders generally favour an approach best described as ‘take a run at it!’ Hence, although the ascents are comparatively brief, 15% plus gradients are not unusual. Fortunately with this ascent, the grinding climb is well worth the effort, as the views over the city, even reaching as far as the Mourne Mountains in Northern Ireland, can be breathtaking. After a breather to appreciate the scenery, the climb continues into Wicklow County where the spectacular windswept moorlands of the sparsely populated region appear. Wind and driving rain is always a risk in this region no matter what time of the year, so best to pack some rain gear. But if you’re lucky with the weather, Wicklow presents some of the most delightful scenery to ride a bike through. A brief, but thrilling descent brings the route to a signposted junction. Beyond is the infamous Sally Gap which separates cyclists into two camps; A) the Tourist B) the Masochist. For the time being, best to swing a left into the hidden haven of Glencree. Glencree is a fascinating micro-village formed around a beautiful ‘retreat centre’ that hosts a variety of spiritual and artistic projects. It also contains an excellent restaurant, a particularly beautiful river gorge and the option of a fascinating historic detour to see a burial ground for German soldiers who died on Irish soil during World War 2. 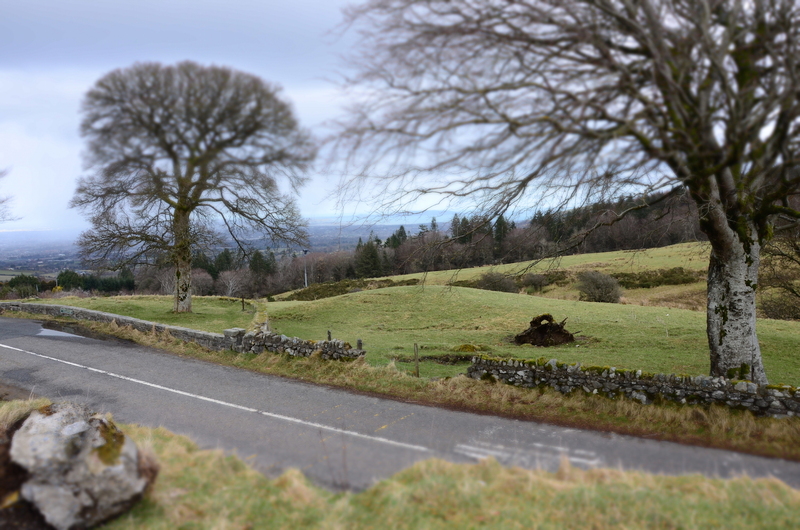 Leaving Glencree, a winding gradual descent snakes for several kilometres along admittedly poor roads. Some care should be taken here are there are several concealed entrances and farm equipment can often be encountered on blind corners. The left turn appears during the descent, and although it is signposted, it can be easy to miss. Best to keep your eyes open for a yellow bus stop on your left hand side, then take the next turn. The continuing road marks the return of some bizarre, but thankfully brief climbing gradients, but once more the views to the right where the sea and Bray head appear, make it worth taking your time grinding up a hill or two. Relief comes in the form of a slightly alarming descent that seems to appear out of nowhere, but immediately after bottoming out by a small stone bridge, the most improbably steep hill I have ever encountered seems to spring from around a corner with almost comic timing! If you make it up this without putting your foot on the ground, you should be proud of yourself. Not soon beyond, a junction to the small village of Glencullen and Johnny Fox’s Pub appears. Despite being in a sparsely populated, and challenging to reach, Johnny Fox’s is not only Irelands highest but one of the most popular pubs in the country. Bus loads of tourists are whisked up to this remote spot daily, and although for some it suffers from its own commercial success, seeming like a place where Darby O Gill might be expected to found behind the bar, it does serve superb food. There is an option at Glencullen to loop back on the road to Cruagh and return on exactly the same route you ascended to begin with. 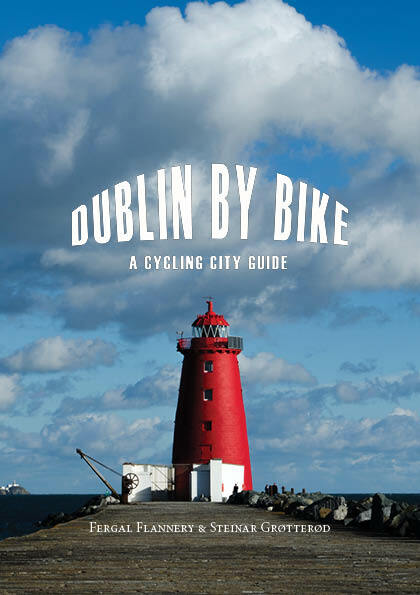 Alternatively, you can follow the route, skirting the eastern side of Three Rock Mountain, Dublin’s most popular mountain biking destination, and continue back towards Stepaside. Whereas Johnny Fox’s appearance of being an authentic scruffy Irish boozer is no more convincing as an Irish Bar in Thailand, the Blue Light bar that is passed now is the real deal, and has ‘scruff’ in spades. As popular with motorcyclists as it is with cyclists, its well worth a quick pint of Guinness infant of a real turf fire. Beyond the Blue Light, a short roller coaster ride of a descent sends you hurtling back to the city suburbs in the blink of an eye. Caution on blind corners is highly recommended, as the large busses that service Johnny Fox’s can appear without warning. At the bottom of this descent, it is merely a gradual downhill roll through some of Dublin’s more salubrious suburb. In no time at all you will find yourself back in congested traffic, and probably amazed to discover how short a distance it is from Ireland’s capital city to the rugged, rural retreat of the Dublin Mountains. The wonderful views. Try to time your trip with good weather and you will be in for an unforgettable treat. The beautiful hidden haven of Glencree and the German Military Cemetery. Read the fascinating history of the Military Road, the Glencree Barracks and the rebels fights. Have a pint and warm your bones in front of a turf fire at The Blue Light.